For when, then, the expected liberalization of the ancient rite? Hard to answer. What seems to be certain is that the text of the "Motu proprio" by Benedict XVI is ready. Recently, moreover, it seems that the Pope spoke about it in a private audience with Robert Spaemann, philosophy professor at the University of Munich, the great Catholic intellectual to whom Ratzinger himself dedicated the book "Church, Ecumenism, and Politics" (Kirche, Ökumene und Politik). An audience -- the one the Pope granted to Spaemann -- of which little has been known, even if it is said that the German professor left it with the belief that the "Motu proprio" will be made known soon, maybe even within the month. The website of the Fifth General Conference of Latin American Bishops has just released a summary (in Spanish) of the main document of the Aparecida Conference -- another uninspiring document, filled with ideologically-motivated clichés, as the Catholic hemorrhage in Latin America goes on... The word "sacramentos" is not even once mentioned in the summary -- and how will a true "missionary spirit" rekindle a "new Pentecost" (sic) in Latin America without the Sacraments which were the essence of the Spanish and Portuguese missionary effort in the Western Hemisphere? Naturally, we did not expect anything else: the best text of the Conference remains the Pope's opening address (and his best speech in Brazil remains his remarkable address to the Bishops of that nation). 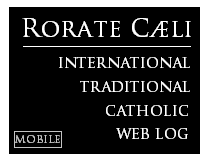 Well, well... We are evolutionists here at Rorate Cæli! For instance, we notice a clear evolution of Mr John Allen Jr. -- who barely a year ago considered the liberalization of the Traditional Mass by a personal act of the Pope as a kind of myth and now writes an Op-Ed piece about the document in The Aborti --oops, The New York Times. Allen is a fine fellow, but he is more a newsmaker than a news gatherer, in the best "tradition" of contemporary American Church reporters, such as Robert Blair Kaiser. He and his sources wish to influence events or to alter the way future decisions are perceived and interpreted, and that is how his words should be read. Well, he lived up to it once again. His article could be summed up as: "Those terrible 'conservatives' will hype it as tremendous; those 'immoderate liberals' will despise it as retrograde; I, the establishment moderate liberal, representative of the enlightened Catholic 'Via Media of the 21st Century' annoint it 'not that big a deal'." 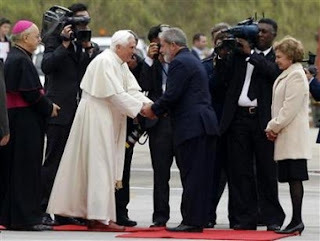 "...Benedict XVI received [last] Saturday morning, in private audience, Spaniards Kiko Argüello and Carmen Hernández and Italian priest Mario Pezzi, the group responsible for the Neocatechumenal Way at the international level. As Kiko Argüello declared to this daily, the Pontiff confirmed to them the definitive approval, shortly, of the statutes of this Christian initiation for adults. The current texts had been approved in June 2002 by John Paul II for an "ad experimentum" period of five years. 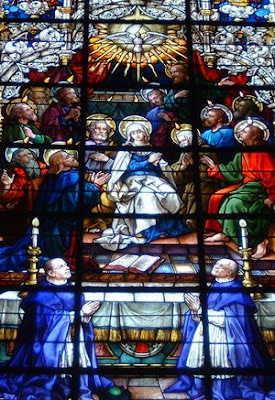 ...from the day of Pentecost, the Holy Spirit does not cease to scatter [the Church] through the paths of the world, to the extreme ends of the earth and to the end of time. This reality which we may verify at all times is as if anticipated in the Book of the Acts, where the passage of the Gospel from the Jews to the pagans, from Jerusalem to Rome, is described. Rome indicates the world of the pagans, and therefore all peoples who are outside the ancient people of God. In fact, the Acts conclude with the arrival of the Gospel in Rome. It may then be said that Rome is the concrete name of Catholicity and of Missionarity, it expresses faithfulness to the origins, to the Church of all times, to a Church which speaks all languages and meets all cultures. 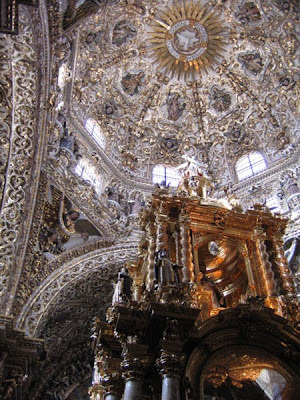 The Chapel of the Holy Rosary in the Conventual Church of the Dominicans in the historic city center of Puebla de los Ángeles, Mexico, one of the most majestic works of Catholic art in the Americas, is crowned by a simple, innocent figure: a dove. Surrounding it, a message to all visitors: Spiritus Domini requiescet super Eam. 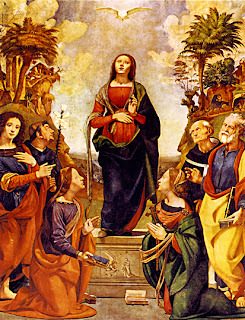 She (...eam) is the Woman whose life was surrounded by the joy of the Holy Spirit from (Immaculate) Conception to Assumption, the one whose mystical union with the Paraclete was so intense that she had to be present in the miraculous day of Pentecost as a Spiritual Teacher, as the one who, by her example, by her own self, could show to those privileged pillars of the Church the Glory of the Risen Son through the action of the Consoling Spirit. The Superior-General of the Priestly Fraternity of Saint Pius X (FSSPX/SSPX), Bishop Bernard Fellay, speaks (May 16, 2007) about the "motu proprio" on the liberalization of the Traditional Mass. An interesting history of events, for those who are not aware of it. 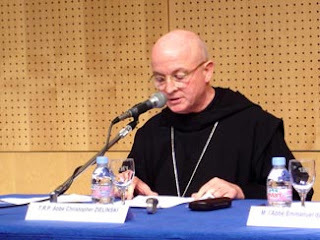 The Italian press has been filled with articles on the liberalization of the Traditional Roman Rite for the past two days, but it must be clarified that they contain mere excerpts of Castrillón's address at the Aparecida Conference. The Mexican news agency Notimex published a news release (see website of Mexican National daily Milenio) based on an interview with Cardinal Castrillón Hoyos. The article includes the information that "The... President of the Pontifical Commission Ecclesia Dei revealed in an interview with Notimex that this document [the motu proprio] is already written and its release will take place in the next few weeks." Since this is not an actual interview, but an article based on an interview, it is not clear what were the genuine words used by Castrillón regarding the document and its current status. "There is no turning back, [the Pope] is not leading the Church to a reverse position; the Pope is the Vicar of Christ and has the Holy Spirit who always guides him forward, which does not mean that things which may have deteriorated may not be perfected." "It [The Traditional Mass] will not be imposed on anyone, it does not in any way contradict the current [Mass], the Mass of the Council Fathers was that of Saint Pius V, they did not celebrate the Mass of Paul VI, these two Masses are not be be [mutually] opposed." "In the Mass of Saint Pius V there is a ritual expression which is enjoyed by some; there are those who wish to celebrate it occasionally, but without it meaning any disregard, [but] complete respect for the new rite." "The Pope wishes to preserve for mankind a treasure which sanctified the Church for more than a thousand years: the rite codified by Saint Pius V; this treasure, this cultural expression, this language which was the language of the Church from the earliest time". [Benedict XVI] "loves the liturgy [and] does not wish to retroact, does not intend to impose, it is an offer for those who have this sensibility." "They are not schismatics, the priests are under a suspension for illicit exercise, and the Bishops are excommunicated because the ordination of new bishops without a permission from Rome received this punishment latæ sententiæ." Pope wishes to "extend the possible use of the 1962 books to all Latin Church"
There are, naturally, several extremely important aspects in the Cardinal's address in Aparecida. For those who remained skeptical (are there any left? ), another confirmation of the Holy Father's determined will to "extend to the entire Latin Church" the celebration of Holy Mass (and all other Sacraments) according to the 1962 liturgical books. While that merely confirms the clear words of Cardinal Bertone, it is quite an improvement for Castrillón who until very recently still presented the matter as probable, not as certain -- as he clearly does in his Aparecida speech. Nonetheless, Pope Benedict seems quite determined to accomplish this which could be the most important act of his pontificate: the establishment (out of his own will, motu proprio) of a clear legal framework for the "Extraordinary Form of the Roman Rite". "Women's ordination is not a closed matter"
The Pope recognized that the Church has a certain debt to women. We know that, at this time, the dialogue on the possible ordination of women is closed in the Church. Which does not mean that it cannot be opened. Wow... "Progressive" bishops are just so used to distorting the message of the Gospel that they cannot even understand what is spoken by the Successor of Peter. The Pope actually said that "chauvinism" ("machismo") is a problem in some Latin American families, not in the Church; and then he added that what those families need are women who are good mothers and housewives: women must be able to "dedicate themselves fully to bringing up their children and to the service of their family". We will be covering the most interesting and troubling aspects of the General Conference of the Latin American Bishops throughout the month. CELAM "peritus" says "Pope's words are erroneous and indefensible"
...what did the acceptance of the Christian faith mean for the nations of Latin America and the Caribbean? For them, it meant knowing and welcoming Christ, the unknown God whom their ancestors were seeking, without realizing it, in their rich religious traditions. Christ is the Saviour for whom they were silently longing. 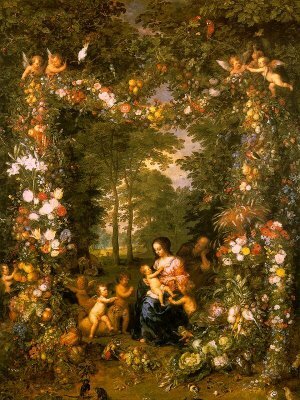 It also meant that they received, in the waters of Baptism, the divine life that made them children of God by adoption; moreover, they received the Holy Spirit who came to make their cultures fruitful, purifying them and developing the numerous seeds that the incarnate Word had planted in them, thereby guiding them along the paths of the Gospel. In effect, the proclamation of Jesus and of his Gospel did not at any point involve an alienation of the pre-Columbian cultures, nor was it the imposition of a foreign culture. Authentic cultures are not closed in upon themselves, nor are they set in stone at a particular point in history, but they are open, or better still, they are seeking an encounter with other cultures, hoping to reach universality through encounter and dialogue with other ways of life and with elements that can lead to a new synthesis, in which the diversity of expressions is always respected as well as the diversity of their particular cultural embodiment. In 1992, John Paul II had officially spoken of wrongdoings committed in the process of evangelization of the indigenous peoples of the Americas. "We condemn the Pope's words," said Tuxa. "To say that the cultural decimation of our people constitutes an act of purification is shocking and, frankly, alarming." "I believe that the Pope was ill-adviced". The very Church-based group of support to the local indigenous populations, known under the name of Cimi, has also distanced itself from the Pope's words. "The Pope has not understood the reality of the situation of Indians here. His words are erroneous and indefensible," Father Paulo Suess, a leader of the Cimi, told Reuters. "I myself am upset." A longer version of events surrounding the article, published by The Times today, on the eventual release of the Motu Proprio for the liberalization of the Traditional Roman Rite. We repeat: do not worry about the actual date of the document (or the date or... specific month of its publication); that is a recipe for continued frustration. May the Pope enjoy a wholesome period of rest at Castel Gandolfo. Excerpts of the Opening Speech of His Holiness to the Fifth General Conference of the Bishops of Latin America and the Caribbean, delivered in Spanish (mostly) and Portuguese. ...it is true that one can detect a certain weakening of Christian life in society overall and of participation in the life of the Catholic Church, due to secularism, hedonism, indifferentism and proselytism by numerous sects, animist religions and new pseudo-religious phenomena. The Utopia of going back to breathe life into the pre-Columbian religions, separating them from Christ and from the universal Church, would not be a step forward: indeed, it would be a step back. In reality, it would be a retreat towards a stage in history anchored in the past. What is real? Are only material goods, social, economic and political problems “reality”? This was precisely the great error of the dominant tendencies of the last century, a most destructive error, as we can see from the results of both Marxist and capitalist systems. They falsify the notion of reality by detaching it from the foundational and decisive reality which is God. Anyone who excludes God from his horizons falsifies the notion of “reality” and, in consequence, can only end up in blind alleys or with recipes for destruction. This political task is not the immediate competence of the Church. Respect for a healthy secularity — including the pluralism of political opinions — is essential in the authentic Christian tradition. If the Church were to start transforming herself into a directly political subject, she would do less, not more, for the poor and for justice, because she would lose her independence and her moral authority, identifying herself with a single political path and with debatable partisan positions. The Church is the advocate of justice and of the poor, precisely because she does not identify with politicians nor with partisan interests. How does the Church change societies? The Marxist system, where it found its way into government, not only left a sad heritage of economic and ecological destruction, but also a painful destruction of the human spirit. And we can also see the same thing happening in the West, where the distance between rich and poor is growing constantly, and giving rise to a worrying degradation of personal dignity through drugs, alcohol and deceptive illusions of happiness. The most substantial speech delivered by the Pope during his Apostolic Journey to Brazil will remain his blunt Address to the Bishops of Brazil in the São Paulo Metropolitan Cathedral, a pronouncement of whose worldwide implications we will speak shortly. 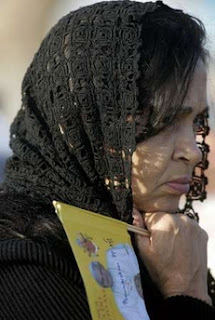 The ninetieth anniversary of the Apparitions of Our Lady in Fatima takes place today. It undoubtedly is, with its vehement plea for conversion and penance, the most prophetic of modern apparitions. Let us ask the Mother of the Church, who knows the sufferings and hopes of mankind, to protect our homes and our communities. ... The Church is our Home! This is our Home! We have in the Catholic Church all that is good, all that provides safety and solace! bless its lands and its homes. À nos lecteurs francophones: la version française du livre de prières mariales «Ma vie avec Marie» est désormais disponible gratuitement sur Franciscan Archive. Not even the setting (the beautiful and vast Metropolitan Cathedral of São Paulo), the music (some tasteful polyphonic pieces and an aesthetically deficient, yet dignified, use of plainchant for the psalms and hymns of Vespers -- unfortunately, in the vernacular), nor the overall attentive mood of those who were present at the event could possibly have prepared the largest episcopate in the world for the remarkable speech of the Holy Father to the Bishops of Brazil. The Holy Father delivered a precise diagnosis of the deep crisis of the Catholic Church in Brazil - extensive to many other nations: all important topics were covered by the Pope, from liturgical disobedience to attentiveness to the sexual maturity of seminarians, from a condemnation of the use of the Church as a field for ideological confrontation to the need to be clear in all ecumenical settings that the only Church of Christ subsists in the Catholic Church presided by the Successor of Peter. In our modest opinion, this remarkable speech (in English - called a "homily" in the Official Program, due to its liturgical setting, but not particularly homiletic) is one of the most important of the Pontificate, along with the Christmas Address of 2005 and the Regensburg Address of 2006. The true question is, however: will the bishops of the world understand and take heed of this Papal reprimand? The mission which is entrusted to us [bishops], as Masters of the faith, consists in remembering, as the same Apostle of the Gentiles wrote, that our Savior "wishes all men to be saved and to reach the knowledge of truth" (I Tim 2, 4-6). This, and not anything else, is the purpose of the Church: the salvation of souls, one by one. ......in the Church's bosom, when the worth of priestly commitment -- as a total pledge to God through the apostolic celibacy and as total availability to serve souls -- is questioned, with preference being granted to ideological and political, even partisan, questions, the structure of total consecration to God begins to lose its deepest significance. How can we not feel sorrow in our soul? But be confident: the Church is holy and incorruptible! (cf. Eph. 5, 27). Saint Augustine said, "The Church will fail if its foundation fails, but shall Christ fail? 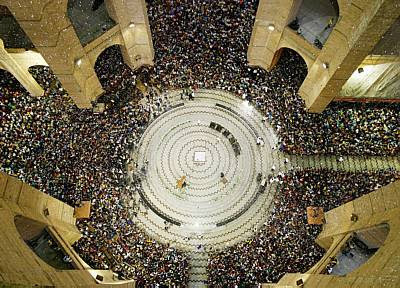 As Christ cannot fail, the Church will remain intact until the end of time." It seems clear that the main cause, among others, for this problem [of Catholics who leave the Church] can be attributed to the lack of an evangelization in which Christ and His Church are in the center of every explanation. It is not enough to observe reality through faith; it is necessary to work with the Gospel in the hands and grounded on the rightful heritage of Apostolic Tradition, without interpretations caused by Rationalist ideologies. Some among you have fomented movements of evangelization to help the gathering of the faithful in a line of action. The Successor of Peter counts on you so that your groundwork shall always be anchored to that spirituality of communion and fidelity to the See of Peter, so that the action of the Spirit will not be in vain. In effect, the integrity of the faith, along with ecclesial discipline, is and will always be a theme which will demand attention and zeal from all of you, especially when one considers the consequences of the fact that there is "one only faith and one only baptism". 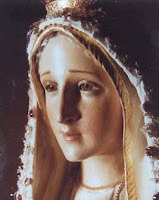 [The Blessed Virgin Mary], the Tota Pulchra, the Most Pure Virgin, who conceived in her womb the Redeemer of Men and who was preserved from all original stain, wishes to be the definitive seal of our encounter with God, our Savior. The world needs clean lives, clear souls, simple minds that reject being considered as creatures [who are] the object for pleasure. It is necessary to say "No" to those media of social communication which ridicule the sanctity of matrimony and virginity before marriage. Let us thank God the Father, God the Son, God the Holy Spirit, from Whom, through the intercession of the Virgin Mary, all heavenly blessings come ... . 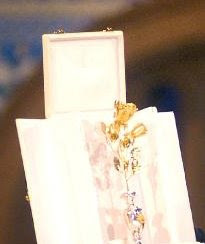 Above all, have great respect for the institution of the sacrament of Matrimony. There cannot be true domestic happiness unless, at the same time, there is fidelity between spouses. Marriage is an institution of natural law, which has been raised by Christ to the dignity of a sacrament; it is a great gift that God has given to mankind: respect it and honour it. At the same time, God calls you to respect one another when you fall in love and become engaged, since conjugal life, reserved by divine ordinance to married couples, will bring happiness and peace only to the extent that you are able to build your future hopes upon chastity, both within and outside marriage. ... Seek to resist forcefully the snares of evil that are found in many contexts, driving you towards a dissolute and paradoxically empty life, causing you to lose the precious gift of your freedom and your true happiness. 2. For some great pictures of the Holy Father's Apostolic Journey to Brazil (in several sizes), go to the galleries at Visita do Papa. Rabbi Henry Sobel, president of the rabbinate of the São Paulo Israelite Congregation (CIP) said yesterday, after leaving the ecumenical and interreligious meeting with the Pope in the Monastery of Saint Benedict, that he was not only blessed by Benedict XVI, but also had the opportunity to bless him. "With great humility, I asked for a blessing and was blessed. I also asked the Pope's permission to bless him, a permission which was granted to me". He declared himself "light and happy" and he mentioned that he had no opportunity to show regret for the necktie shoplifting episode [Say what? Oh... this], for which he was arrested last March 23, in Florida. I am very happy to be able to spend a few days with the Brazilian people. I know that the soul of this people, as that of all Latin America, conserves radically Christian values which will never be cancelled. And I am certain that, during the General Conference of the Episcopate, such identity will be reinforced, by promoting respect for life, from its conception to its natural decline, as a demand proper to human nature... .
What does that Eucharistic Prayer really say? An article by our reader Antonio Basto, an attorney and law professor in Rio. The Vatican website released the Presentation of Pope Benedict's apostolic voyage to Brazil (in Portuguese; in Italian), a document signed by the much (ill)-famed Archbishop Piero Marini, Master of Pontifical Liturgical Celebrations. As it usually happens, the document of presentation contains a chapter about the Liturgical Book of the Apostolic Voyage, a special liturgical book condensing the rubrics for all the liturgical actions to be celebrated during a Papal Trip. 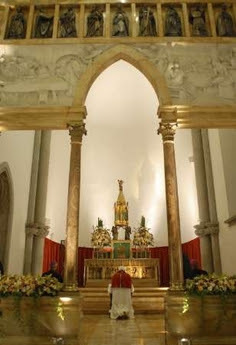 According to said document of Presentation, the texts are in Portuguese as a rule, with the exception of the celebration of one Mass and of Vespers [both in the day when the Latin American Episcopal Conference-CELAM Conference is to be opened], in which, apart from Portuguese, the Spanish, French, and English languages are also used; furthermore, some sung texts are in Latin. Apart from the private Masses that the Pope will celebrate in the places that will host him (the St. Benedict Monastery of São Paulo and the Good Jesus Seminary of Aparecida), the Pope will celebrate two public Masses, one in São Paulo, on Friday, May 11th, and another in Aparecida, on Sunday, May 13th. The first public Mass will be the Mass for the Canonization of Blessed Antonio de Sant'Anna Galvão, and the second, the opening Mass of General Conference of the CELAM. Regarding this second Mass, the Presentation informs that His Holiness will use Eucharistic Prayer III. However, the same document declares that, for the Mass of Canonization, His Holiness will employ Eucharistic Prayer V! That is correct, it is not a typo: Eucharistic Prayer... V! This requires an explanation: thanks to bizarre requests on the part of the Brazilian Episcopal Conference (CNBB), and the leniency over the years on the part of the Apostolic See, several other Eucharistic Prayers are approved for use in Brazil, other than the translations of the Eucharistic Prayers I to IV. Those are the Eucharistic Prayer V, which we will discuss in more detail below, and also Eucharistic Prayers VI-A; VI-B;VI-C;VI-D (for various needs); Eucharistic Prayers VII and VIII (for reconciliation); IX, X and XI (for Masses with children). Unfortunately, Eucharistic Prayer V is quite terrible: next to it, Eucharistic Prayer II seems the pinnacle of reverence in prayer. As far as possible for an Eucharistic Prayer, Eucharistic Prayer V contains no mention of the sacrificial nature of the Mass (in fact, the words "sacrifice", "victim", and similar expressions are NEVER used in this prayer), and it also manages to contain an impressive level of cheap, pedestrian language, whereas Eucharistic Prayers I to IV, in spite of the omission of several words and expressions denoting reverence in the process of translation, are still phrased, especially when compared to Prayer V, in respectful language. For instance, Eucharistic Prayer II contains the words "E nós vos suplicamos" ("and we beseech Thee"), and contains several expressions such as "Remember, O Father", in which the "O", makes the prayer sound more reverent (much more reverent than if one were to say "Remember, Father"). It begins by acknowledging the Holiness of the Father, Fountain of all Holiness; it uses words such as "Bread of Life and Chalice of Salvation"... "Chalice of Salvation" is much better than "Wine that gives courage", an expression used by Eucharistic. Prayer V.
Eucharistic Prayer III also employs more than once the verb "beseech", and it refers to the Resurrection as "glorious". Eucharistic Prayer I starts by addressing the Father as "Father of Mercy, to whom our praise goes up" (Pai de Misericórdia, a quem sobem os nossos louvores), it asks "Receive, o Father, kindly, the offering", in the translation of the Hanc igitur, and "Vouchsafe, o Father, to accept..." (in the Quam oblationem); in the Qui pridie, the mention of the eyes of the Lord being raised up to the Father has not been omitted in translation; the Ascension is called "glorious"; in spite of a poorly translated Supplices Te rogamus, the words "we beseech" are employed in the Supra Quae, the line "not by our merits, but by your goodness", was preserved in the translation of the Nobis quoque. 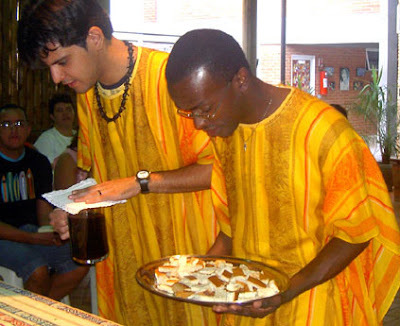 All that serves as a prelude to a comparison between those Prayers and the regrettable Eucharistic Prayer V.
Eucharistic Prayer V was drafted during the First Eucharistic Congress of Manaus, the 9th National Eucharistic Congress of Brazil, held in 1975. It was approved by the Brazilian Episcopal Conference, which requested to the Holy See for permission to include it in the Brazilian versions of the Roman Missal. Such permission was, of course, granted. In Brazil, the use of the Eucharistic Prayer I, the Roman Canon, is quite rare. In most parishes, it is the Eucharistic Prayer II which is used from Monday to Saturday, and the Eucharistic Prayer III on Sunday. So the several other prayers, including the universal prayers I and IV, and the several specific Eucharistic Prayers, are rarely used. However, if one goes to a church whose pastor is an adherent of Liberation Theology, he will be, in all likelihood, dressed without chasuble, wearing only alb and stole without cincture, and one will probably hear, as a general rule, Eucharistic Prayer V. Perhaps it is a coincidence. Or is it? No, it is no coincidence that liberal priests prefer that pedestrian prayer. It is tailored for them. And now, thanks to the organizers of the Papal trip to Brazil, and to the good graces of Archbishop Marini, the Pope, the Supreme Pontiff, will recite that prayer. A prayer that should not even be on the Liturgical Books, that should not be recited by any priest, much less by the visible Head of the universal Church. The papal use of that prayer will send a wrong signal. Papal Masses should be an example of devotion. Instead of the Roman Canon, the concelebrants will make use of the worst Eucharistic Prayer ever to be approved by the Apostolic See, in one of the lowest moments of its liturgical law-giving activity. Congregation: Send your Holy Spirit! 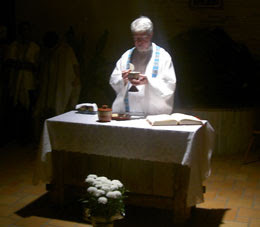 Priest: In the night in which he would be delivered, dining with his apostles, Jesus, having the bread in his hand, looked to heaven ["céu", same word in Portuguese for both heaven and sky] and gave thanks, broke the bread, and gave it to his disciples, saying: TAKE THIS ALL OF YOU, AND EAT: THIS IS MY BODY, THAT WILL BE DELIVERED FOR YOU. Similarly, at the end of the supper, he took the chalice in his hands, gave thanks again and delivered it to his disciples, saying: TAKE THIS ALL OF YOU, AND DRINK: THIS IS THE CHALICE OF MY BLOOD, THE BLOOD OF THE NEW AND EVERLASTING COVENANT, THAT SHALL BE SHED FOR YOU AND FOR ALL, FOR THE REMISSION OF SINS. DO THIS IN MEMORY OF ME. Priest: All this is the mystery of faith! [instead of "Mysterium Fidei", "Behold the Mystery of the Faith", a translation that is common to all other Eucharistic Prayers in Portuguese]. Congregation: Every time that one eats from this Bread, every time one drinks from this Wine, one recollects the passion of Jesus Christ, and one awaits his return. Priest. We recall in this moment, o Father, the passion of Jesus, our Lord, his Resurrection and ascension; we wish to offer you this Bread that feeds and gives life, this Wine that saves us and gives courage. Congregation: Receive, o Lord, our offering! Priest: And when we receive the Bread and Wine, his offered Body and Blood, may the Spirit unite us in one only body, so that we may be one only people in his love. Congregation: May the Spirit unite us in one body! Priest: Protect your Church that walks in the roads of the world towards heaven, each day renewing the hope of arriving next to you, in your peace. Congregation: We walk on Jesus's road! Priest: Grant the Holy Father, Pope N., that he be very firm in the Faith, in charity, and to N., who is bishop of this Church, and to his auxiliary bishops, plenty of light to lead his flock. Congregation: We walk on Jesus' road! Priest: We expect to enter life everlasting with the Virgin, Mother of God and of the Church, and with the apostles and all the saints that in live knew to love Christ and his (the word used could also mean "their") brothers. Congregation: We expect to enter the eternal life! Priest: All those that you called to the other life in your friendship, and to those marked with the sign of Faith, receive them, opening your arms. That they may live very happy forever in the kingdom that for all you have prepared. Congregation: To all give the light that never ceases! Priest: And to us, who are now assembled and are a holy and sinful people, give strength to build together your kingdom that is also ours. Priest: Through Christ, with Christ, in Christ, to you, God Father Almighty, in the unity of the Holy Spirit, be every honour and every glory, now and forever. Eucharistic Prayer V makes use of clearly puerile and informal language: for instance, in "Senhor, vós que sempre quisestes ficar muito perto de nós", "muito perto de nós" (very close to us) is a clear use of informal language. Several other nobler images could be used, but since the drafter decided to speak about God´s proximity, they could use "próximo", instead of the informal "muito perto". The Prayer, following the bad example of Eucharistic Prayer II, starts immediately with the Epiclesis, and, again, the sole use of the image of proximity to God here makes this part of the prayer very poor. In the equivalent of the Qui pridie, instead of using words to denote that Christ looked up to His Father, the word "céu" is employed, which means both Heaven and sky. Instead of "In the night in which he was to be delivered, He took the bread", as is used in most other Eucharistic Prayers, two insertions are here made: one is the "dining with his apostles" phrase, which emphasizes the idea of the Mass as a meal; the other is the replacement of the word "He took the bread", used in most Eucharistic Prayers (a reference to the earlier "Our Lord Jesus Christ") with the informal "Jesus took the bread". "Jesus", plain "Jesus", is informal, and is almost never used in liturgical prayer, at least in Portuguese, for it denotes a Protestant-like intimacy and lack of reverence. The same lack of reverence is noted when the prayer states, "we recall.. the passion of Jesus, our Lord", instead of "the passion of Thy Son", or "Celebrating, therefore, o Father, the memory of Thy Son, of his passion that saves us, of his Resurrection from the dead and glorious Ascension into the heavens", as used in other prayers. Also, "passion of Our Lord Jesus Christ..." would be more reverent than "passion of Jesus, our Lord". There is the absurd reference to "Wine that... gives courage" AFTER the Consecration. No other Eucharistic Prayer does that. Some speak of "chalice", such as in "chalice of salvation" (from the Latin calicem salutis perpetuae translated with the omission of perpetuae). However, no other Eucharistic Prayer speaks of the content of the Chalice as this one does. The content, of course, is the saving Blood of Our Lord, not "this wine that saves and gives courage". The reference to "wine" at this point, is unheard-of. Although references to "bread of life" are common, a reference to "chalice" would be much more appropriate that to "wine". And what is this "gives courage" line? Is that language appropriate for Eucharistic prayers? The reference to the pope and to the Bishop is also done in a different way in this prayer compared to others: there is no reference to "your servant Pope N." or to "our Bishop N.", and that "plenty of light to feed his flock" line is also very pedestrian. In general expressions like "bem firme" (very firm); "bem felizes" (very happy) are informal ones, and thus unsuitable. They are, however, present in this Eucharistic Prayer. The "bem" clause gives that note of informality here. Other Eucharistic Prayers do not use that kind of cheap language, not even in very poor translations. There is, finally, the problem of the acclamations after each paragraph. Certain acclamations after each paragraph of the Eucharistic Prayer were requested by the National Conference of Bishops of Brazil for every Eucharistic Prayer in the books. They can be dispensed with. Almost every parish uses those acclamations, and there are different texts that go with different Eucharistic Prayers. The acclamations themselves are inappropriate, and the fact is that their very existence is a source of disturbance and loss of concentration, as it breaks the unified text of the Eucharistic Prayer into fragmented bits. However, the acclamations for other prayers, such as for prayers I to IV, are a bit more respectful towards God, at least, in that they use the "O" clause much more than prayer V --- "Accept our offering, o Lord" --- or in that they ask "Grant us society with the elect". Grant us (concedei-nos), is a formal verb, and denotes more reverence. Here, however, reverence is totally absent: "Send your Holy Spirit!" -- who do you think you are talking to? That is certainly no way to address God the Father. And also, "We expect to enter eternal life!" -- it is proclaimed with an exclamation point, more like a demand, rather than a humble request. Not to mention the bizarre acclamation, "We walk on Jesus´s road", which sounds more like the language of Protestant neo-pentecostal sects. This line matches another very poor line on the Priest´s part, in which the Holy Catholic Church is referred not as "Thy Catholic Church", "the Church pilgrim on Earth", but in a cheesy way as "the Church that walks in the roads of this world". What is that, country music? As it can be noticed, it is truly deplorable that Eucharistic Prayer V was ever approved as part of Catholic Liturgy -- it is even worse that it will now become a model, after being granted the rubber-stamp blessing of being used by the Pope himself. Second and Third Pictures: Masses celebrated in the Jesuit Youth House of Goiania, Brazil. Roman Rite - 11 am. St Wilfrid's Hall - 2pm. Congratulations to Father Zielinski, O.S.B. 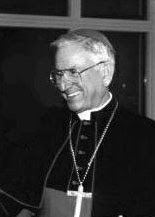 Oliv., Abbot of Our Lady of Guadalupe, in Pecos, New Mexico, and a great friend of Tradition (see previous post) for his designation as Vice-President of both the Pontifical Commission for Sacred Archeology and the Pontifical Commission for the Cultural Heritage of the Church (in the picture, Zielinski in the 2007 Si Si No No Conference, in Paris). After Archbishop Bagnasco, another one of the Siri Boys has been promoted to a special position by Pope Benedict. 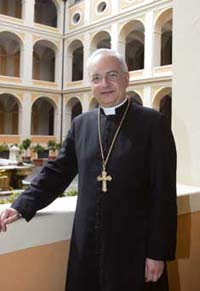 Congratulations to Archbishop Mauro Piacenza, new Secretary of the Congregation for the Clergy, another son of the great Archdiocese of Genoa - in a long conversation with Piacenza, reported last month by Marco Tosatti, His Holiness personally persuaded him to accept the position, cumulative with the Presidencies of the Pontifical Commission for Sacred Archeology and of the Pontifical Commission for the Cultural Heritage of the Church, already held by the Genoese prelate. From a near stability (the decline between 1950 and 1960 is statistically negligible, around 0.6%), a slight decline is noticed between 1960 and 1970, and between 1970 and 1980. 1980 marked the first Papal visit to Brazil -- and the beginning of a demographic slump: in the 20 Wojtylian years registered above, the percentage of Brazilian Catholics fell from 89.2% to 73.8% of the total population . And the latest poll numbers, published this Sunday (read special article on the mess of religious statistics in Brazil in the Spanish e-daily Hispanidad), according to which Brazilian Catholics now encompass merely 64% of the population. 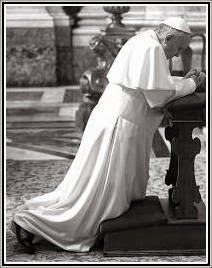 John Paul II Pontificate(post-Conciliar aftermath, 1980-2007): 89.2% to 64% of the population. Only the steep increase of population in the past century has prevented a decrease in the absolute number of Brazilian Catholics. The Church which evangelized Brazil has lost a grip over that nation after decades of a politically-motivated "preferential option for the poor" (it would be unfair to blame solely John Paul II, since the "Liberationist" bishops named by Paul VI thrived for nearly twenty years after his death). What now? Words and conferences have not stopped the demographic hemorrhage of the Church in Brazil. Could Benedict change this grim reality? Fellay: Pope sending "experts" to "difficult nations". When he was in Lausanne, Switzerland, for the consecration of an altar, the Superior General of the Priestly Fraternity of Saint Pius X (FSSPX/SSPX), Bishop Bernard Fellay, delivered a sermon which we have already mentioned. 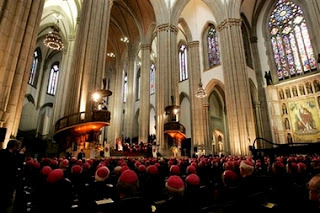 Afterwards, Fellay gave a conference, in which the motu proprio had a prominent position. [Aprox. 27 min] He [the Pope] has decided to prepare its publication by sending "experts" to the "hot" nations, to the nations in which there could be difficulties. How much time will it be necessary to prepare the ground? I do not know anything! It is mentioned now [that it may be published] towards the end of the year. Now, does that mean that is necessary to wait for the end of the year, that it will [be published] sooner... I truly do not know. ... I bring you rumors, noises which come from Rome. And we repeat: do not worry about the actual date of the document (or of its publication); that is a recipe for continued frustration. "Hail, O great gods of Bharata!" 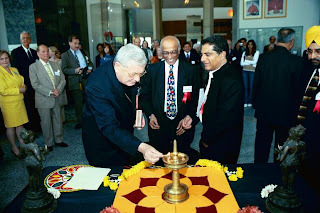 His Holiness' Nuncio to the United States, Archbishop Pietro Sambi, lights a traditional Hindu devotional lamp before the statues of Hindu deities (source). The Brahmins eat sumptuous meals to the sound of drums, and make the ignorant believe that the gods are banqueting. When they are in need of any supplies, and even before, they give out to the people that the gods are angry because the things they have asked for have not been sent, and that if the people do not take care, the gods will punish them by slaughter, disease, and the assaults of the devils. And the poor ignorant creatures, with the fear of the gods before them, obey them implicitly. These Brahmins have barely a tincture of literature, but they make up for their poverty in learning by cunning and malice. Those who belong to these parts are very indignant with me for exposing their tricks. Whenever they talk to me with no one by to hear them they acknowledge that they have no other patrimony but the idols, by their lies about which they procure their support from the people. They say that I, poor creature as I am, know more than all of them put together. The heathen inhabitants of the country are commonly ignorant of letters, but by no means ignorant of wickedness. All the time I have been here in this country I have only converted one Brahmin, a virtuous young man, who has now undertaken to teach the Catechism to children. As I go through the Christian villages, I often pass by the temples of the Brahmins, which they call pagodas. One day lately, I happened to enter a pagoda where there were about two hundred of them, and most of them came to meet me. We had a long conversation, after which I asked them what their gods enjoined them in order to obtain the life of the blessed. There was a long discussion amongst them as to who should answer me. At last, by common consent, the commission was given to one of them, of greater age and experience than the rest, an old man, of more than eighty years. He asked me in return, what commands the God of the Christians laid on them. I saw the old man's perversity, and I refused to speak a word till he had first answered my question. So he was obliged to expose his ignorance, and replied that their gods required two duties of those who desired to go to them hereafter, one of which was to abstain from killing cows, because under that form the gods were adored; the other was to show kindness to the Brahmins, who were the worshippers of the gods. This answer moved my indignation, for I could not but grieve intensely at the thought of the devils being worshipped instead of God by these blind heathen, and I asked them to listen to me in turn. Then I, in a loud voice, repeated the Apostles' Creed and the Ten Commandments. After this I gave in their own language a short explanation, and told them what Paradise is, and what Hell is, and also who they are who go to Heaven to join the company of the blessed, and who are to be sent to the eternal punishments of hell. Upon hearing these things they all rose up and vied with one another in embracing me, and in confessing that the God of the Christians is the true God, as His laws are so agreeable to reason. "We may still be thinking that [any day it will come] in 30 years' time"
It is expected that there will soon be the eagerly anticipated motu proprio to lift restrictions on the Tridentine Mass. Nota bene: The article published in the Catholic Herald is based not in a past speech, but on a fresh interview with Freddy Gray, in which Sacramentum Caritatis and the situation of Traditional Catholics in Britain were also discussed. 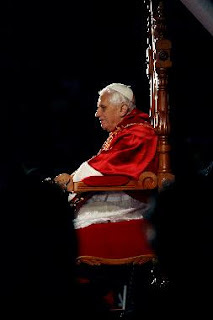 Fellay: Motu Proprio "probably at the end of the year, or even later"
The Motu Proprio "is a strong wish of Benedict XVI, and it is probable that the text will at last arrive". When? "In May", possibly, but "most probably at the end of the year, or even later". Fellay also affirms that the Pope would have been sent a letter by all German Bishops which could be summed up as: "We do not want a Motu Proprio".